A new book edited by Clive Hamilton and others. See Routledge website here. Lots of leading figures have contributions, including Stengers, Latour, and Chakrabarty. The Anthropocene, in which humankind has become a geological force, is a major scientific proposal; but it also means that the conceptions of the natural and social worlds on which sociology, political science, history, law, economics and philosophy rest are called into question. 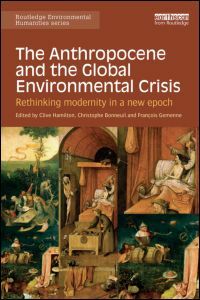 The Anthropocene and the Global Environmental Crisis captures some of the radical new thinking prompted by the arrival of the Anthropocene and opens up the social sciences and humanities to the profound meaning of the new geological epoch, the ‘Age of Humans’. Drawing on the expertise of world-recognised scholars and thought-provoking intellectuals, the book explores the challenges and difficult questions posed by the convergence of geological and human history to the foundational ideas of modern social science. If in the Anthropocene humans have become a force of nature, changing the functioning of the Earth system as volcanism and glacial cycles do, then it means the end of the idea of nature as no more than the inert backdrop to the drama of human affairs. It means the end of the ‘social-only’ understanding of human history and agency. These pillars of modernity are now destabilised. The scale and pace of the shifts occurring on Earth are beyond human experience and expose the anachronisms of ‘Holocene thinking’. The book explores what kinds of narratives are emerging around the scientific idea of the new geological epoch, and what it means for the ‘politics of unsustainability’.